Hands down Rahman sir won the award for best Music Director for Sivaji. The fans were going ballistic every time they showed him on the screen. I was nominated for the Best Female Playback singer for Sahana, and you guessed right :) I did not win. Neha Bhasin won the award for Paesugiraen. Krish was the Best Male Playback Singer for June Pona. To know who else won, you will have to wait for the ceremony to be telecast on Vijay TV! cool. arr got the award !!! Better Luck next time yaar! Even if you did not win Chinmayi I still think you are a winner. Sahana is such a beautiful song and I can listen to it all day. I am so happy that two great singers such as yourself and Krish will be coming to Toronto. fall in love with your singing as soon as you sing Kannathil Muthamittaal. Nopes. Guessed wrong :)I thot u wud win it, cos 'Sahana' is bit complex than 'Paesugiraen', IMO. Ahhww..wish you had got the award..anyways Paesugiren song from Satham podathey is it? 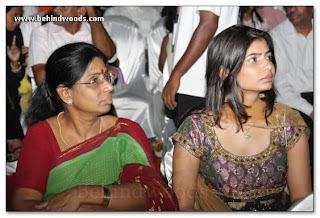 Sahana is a great song Chinmayi..hard luck that you did not win an award for it! If not Vijay Awards 2007, i´m sure it wud b in some other award function! Hard Luck. I do think, you are the winner anyway. I believe that it should only be about how much you enjoyed singing that song for ARR and how it turned out to be a treat for millions. And the amazing reviews you got for that song. Trust me, We enjoyed it even more than you'd have! Awards , true... They do matter. But, in your case, It's just going to be n-1 instead of n, when people evaluate it years from now, when i am gone & you are gone..
And Naren: I am a singer. A student of music. Thats is about it. No expert. And definitely no critic or I do not think that I have the thing it needs to write about or comment about people's music. And I do not "appreciate music that only I am associated with". I just note it down here. Its easier to talk about recordings and shows I am associated with because there is some first hand experience that I can share. As for the others it will be only as a listener's point of view. About the music I love and the songs I listen to, I speak on my show on Radio. I sing, but I have never mentioned that this blog is about music. My mom blogs on Music. There are others who do. As for this one, its just a public diary about me that I might stop writing sooner or later. Its what I go through on an everyday basis, and even that a lot of it I eschew and don't pen it down here. Hope that clarifies. i guess "sahana" deserves an award and is better than any other melody in 2007. Better luck next time. When is it gonna be telecasted??? Why dint you get into acting? I wouldnt be surprised if you had gotten offers? anonymous: Because honestly I cannot act :) Its a very very tough job buddy.! By the way Mr.Norway KK etc. I am sure we will meet soon and I shall look forward to that. do leave a note to say that the comment has been deleted when u reply to a deleted comment. Hi Chinmayi Akka,im Vinod from Malaysia. did not win the award,you are still one of the best playback singers of recent times.Sahana was really fantastic and keep up the good work. Best of luck and hope you win more awards in the future. u look gorgeous. i luv ur hair cut! nd i liked sahana better than pesugiren :P! anonymous: you can edit that comment and send it again..i will publish that.. please do not use my blog to criticize other singers in the industry.. and of course I don't think I am great, if that appeases you. It is very sad that u didnt got the award.. I am damn sure Sahan is the best song of the year 2007 and there are lot of proofs for that it stood No1 in all the TV channels in Annual Top ten songs. Who can forget the song u have sung so marvellously.. i like it very much than u wud do...esplly the aalabh at the end.. If u didnt get the award too .. its we ur fans award u the same. 'Sahana' is an awesome song which deserves an award, if 'Pesugiren' was not there in the list. I am a fan of ur 'Oru deivam thandha poove(KMI)' and 'Naan mutham thinbaval(GURU)' ; but I forget the world when I listen to 'Pesugiren'. Her(Neha Basin) pronunciation in the song (Tamil words) is awesome. well my friend your biggest award is that you you have the Music Guru behind u always.